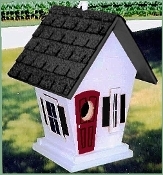 A unique, one of a kind House style birdhouse with windows, shutters, front door, and shingled roof. Many color choices. Great gift for the hard to buy for person. Fun to watch birds use this birdhouse.